This is pretty cool. If I owned a good receiver, I would definitely give it a try. 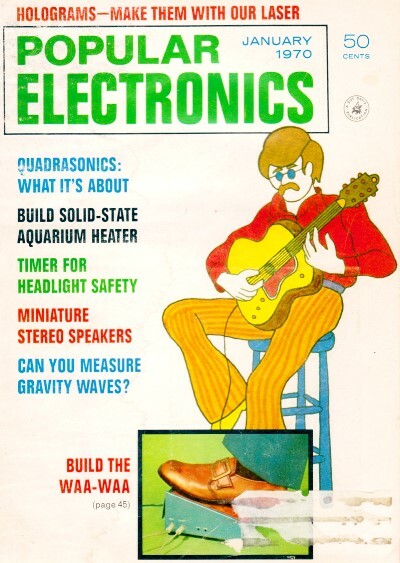 In 1970 when this Popular Electronics article was written, a lot of Hams were still using tube receivers so the recommendation to let the equipment warm up for several hours prior to making the fine frequency adjustments was good advice. Nowadays the warm-up time and stability of receivers should permit 30 minutes or so to suffice (even ovenized frequency references need time to stabilize when first powered up). Unless I missed it, the author does not explicitly state that the frequency change measured over time is due to gravity acting on the mass of the crystal reference, but I suspect that is his intention since part of the experiment involves disconnecting the antenna and shielding the receiver from outside interferers. Over a lunar month period (29.5 days) we experience a leap tide and a neap tide which maximizes and minimizes, respectively, the vector sum of gravity and therefore should result in the greatest excursions. Maybe with a super-stable source, a larger scale phenomenon such as a planetary syzygy could be detected (but I doubt it). Sample graph shows the plot of frequency changes versus time. 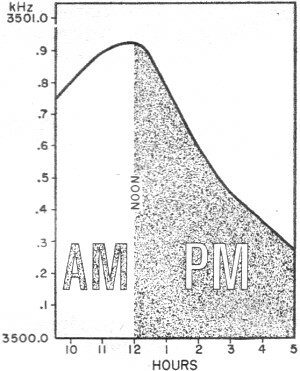 Note that plot­ted line peaks out shortly after noon. We are all familiar with the natural phenomenon known as gravity; but most of us tend to think of gravity on the surface of the earth as being constant. In fact, it is always changing in magnitude, due mainly to the forces exerted on the earth by the sun and the moon. The variations are, of course, so minute that only in the past few years have they been detected by specially designed, highly sensitive instruments. Oddly enough, my years of research into the phenomenon have shown that the average ham radio CW receiver can apparently "detect" changes in gravity. The effects of gravity on a receiver might account for its drifting off frequency. Even after communications receivers have had time to become thoroughly temperature stabilized, frequency drifting and periodic returning are common occurrences. Taking advantage of the effects the forces of the sun and the moon have on the earth's gravity, you can experiment on your own. All you need is a receiver with an ultra-fine scale on its tuning dial. (One that has 10 divisions for each minor division on the main tuning dial scale.) Remember that gravity variations are on the order of only 10-6 part of the weight of the mass in which they are produced. Although the effect of the variations is greatly amplified by your receiver, the end result is still minute. To perform the experiment, disconnect the antenna and any other leads that might pick up a signal at either 3500 or 7000 kHz. In the morning, set the tuning dial of your CW receiver to either of the above frequencies and adjust the BFO for zero beat. Allow the receiver to warm up for several hours. Then reset the BFO for zero beat. Every half hour or so after this, see if it is necessary to retune for zero beat. Record the new dial setting and make up a graph similar to that shown here. The frequency changes you record will be very small so use an expanded scale. The recorded frequency variations will increase or decrease, depending on whether the magnitude of gravity is increasing or decreasing, respectively. You will notice that after the sun or moon passes the zenith, the curve will begin to bend downward. Also, the curve will change from day to day because of variations in the orbits of the sun and the moon. "A completely new branch of astronomy is opening up with the recent discovery of gravitational waves by Dr. Joseph Weber of the University of Maryland. The force of gravity is the most fundamental and least understood force in the universe; confirmation that gravity varies will be detected may well turn out to be as important as the discovery of radio waves by Heinrich Hertz in 1887." -The Industrial Bulletin, Arthur D. Little, Inc.